Bust a move with your weight – stop feeling stuck! Decrease inflammation! Feel lighter with less swelling…everywhere. See total cholesterol drop…up to as much as 70 points – wow! Much improved energy PLUS happier attitude! Feel spunky and sassy again! Lose the bloating and gas…goodbye to the big, round tummy! 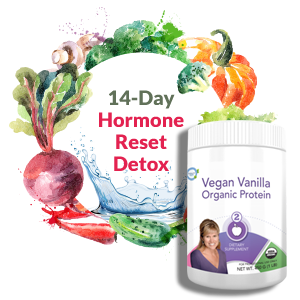 I’ll show you how to feel so much better so quickly – in just 14 days! Meal Plans – We eat a lot, so be prepared to maybe eat more than you normally do. Private FB group for more support. Beginning Health Assessment and ending health assessment so you can see your progress. VeganOrganic™, an organic, natural pea protein isolate, offers a high level of functionality and nutritional benefits. 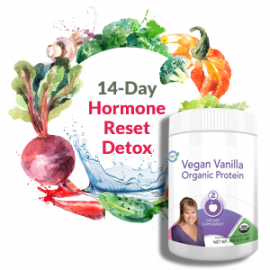 VeganOrganic™ is a true vegan protein which has high bioavailability and excellent digestibility. * The raw materials, certified organic North American grown yellow peas, are not genetically modified (non-GMO) and are produced with a natural fermentation process which uses no chemical solvents. VeganOrganic™ Vanilla contains no sucrose, fructose, or artificial flavors/sweeteners. It is flavored with certified organic natural flavor and certified organic stevia leaf extract. Want a discount? Become a member by purchasing PCOS 5-Element System - Monthly Subscription, PCOS 5-Element System 6 Month Plan, PCOS 5-Element System 3 Month Plan or PCOS 5-Element System 3 Month Subscription, or log in if you are a member. ©2019 Insulite Health. All rights reserved. Insulite Health does not provide medical advice, diagnosis or treatment.